Running your own business means having to wear all different types of hats. Whether it’s your marketing hat, your sales hat, or your general people skills hat, you’re going to need to know how to court sales, and on the other side of operations, you are also going to need to know how to run a balanced account and continue to grow your wealth. While starting a new business or before making new advancements in your current business, it is important that you don’t ignore digital spectrum and online market. This requires designing a strong, comprehensive, and scaleable online marketing strategy. Whether you are a small company or a larger one, this is true for all type of businesses. Internet offers you a borderless market, where you can reach out prospects without any legal, physical or border limitations. Here are 5 basics of online marketing that every entrepreneur must know in order to move ahead with a strong digital strategy. A normal online campaign is usually expected to end up profitably. This is also referred to as “single sale campaigns” due to the fact that every sale is planned to be productive. These campaigns can end up being fruitless because of rising advertising expenses and price wars. One solution is to make it productive with upsells and the life time estimation of a recently acquired client. In simpler words, don’t stick to just one objective for the campaigns. Set multiple goals (A, B, C) and project a return. Once the campaign ends, conduct a performance audit of different goals and see what is missing, what worked, and what didn’t work. If someone didn’t purchase but signed up for your newsletter, it should be a welcome start. Buyers need to know they are buying from experts. Whether you offer a product or service, buyers need to know your level of capacity in that marketplace. Blogging gives a way to show that you are an authoritative figure that is searching for your client’s interests. While buyers sees you are willing to give free insight into their issue, they are more motivated to buy from you. For example, we at Makesbridge provide you a marketing automation platform that is made for email marketers, digital campaigners and sales people. In order to enhance our outreach, we dedicated to start this marketing blog. What we do here is highlight your problems and propose a solution. This is one way of marketing but the story doesn’t end here. Blogging is also a useful tool from SEO perspective. Through consistent reforming your site with shareable content, you’ll have a greater presence on search engines like Bing or Google. This will let new clients discover your business and help you attract new leads. Give someone else a chance to do the heavy lifting. By introducing a couple of pixels you can let advertising platforms to gather information about your customers and learn more about their online practices. These pixels will then work as a target tool and help the marketing platforms to discover more customers with similar online behaviors with the objective to boost up your online sales. For example: Facebook Lookalike Audiences target the people having same preferences like who already like your page or profiles similar to the profiles of your existing customers. Social media offers targeted strategies that are perfect for your business. Think from a strategist’s perspective; can you ignore Facebook with 1.44 billion users, Twitter with over 316 million users and LinkedIn with 364 million contacts? Of course not… but the problem is ‘multiple domains’ and ‘limited budget’. So, if you are in B2B domain, LinkedIn and Twitter are the best solution to connect with prospects. Contrary to this, if you are running more of a B2C business model; Facebook, Twitter, Instagram, and Pinterests offer great ways to interact with customers. What’s surprisingly amazing about social media is that it is always adapting. This provides your business with a chance to be innovative. Using newer platforms like Instagram, SnapChat or Vine, you can discover ways to target younger generations. But don’t forget to have a ‘Plan’. By integrating different analytic tools like Google Analytics, you are able to measure the success or shortcomings of a campaign. You are able to see what avenues are working and which ones may need to be adjusted for better results. Don’t forget that a couple of testing doesn’t work at the get-go. If they aren’t working in the beginning, you may need to give them time. They may need a small tweak to boost conversions. 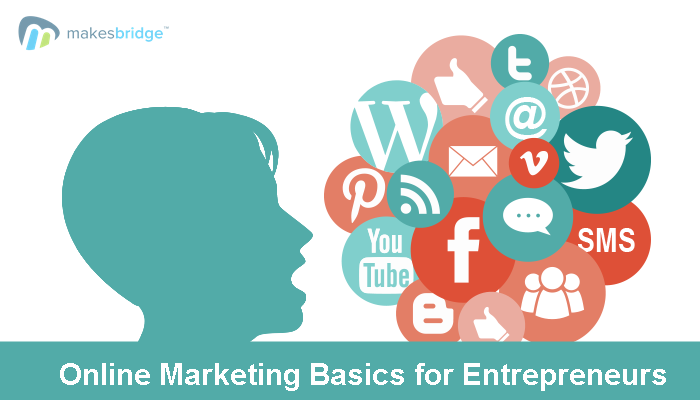 These are only a couple of the basics for online marketing. If you haven’t incorporated this into your advertising strategy, it may be the right time for this. Businesses that are productive understand the increasing access to customer information on the online. This can be used to make more compact advertising campaigns. If you really want to grow fast and save your time/resources, use marketing technology to your advantage. There are many tasks in marketing that you can automate and save your time. There are two things that make marketing automation very essential part of modern business. First is its ability to create and manage relationship with prospects (without involving you every time). Secondly, real-time marketing intelligence that provides insight into hot leads, possible customers, and behavior of different people at your website, blog, or email message. Compare different marketing automation platforms and see their features. In addition, always go for a “demo account” before signing up because it saves your lots of time and helps in getting familiar with the platform.